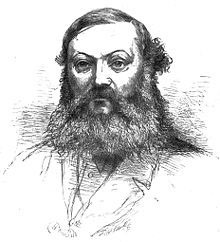 John Thomas Case was born in Scotland around 1819. John Thomas Case came to Lewes during the 1850s to work for a local tailoring firm. According to Mark Antony Lower, the proprietor of a boarding school at St Anne's House in Lewes, John Thomas Case was "a self-taught amateur of the art of Photography". Employed as a tailor's foreman, John Case could only practise his photography in his spare time, during the "few leisure hours" available to an ordinary working man. Mark Antony Lower was a leading figure in the Sussex Archaeological Society and it was at his request that John Case took a number of photographic views of the "ancient town" of Lewes. With the assistance and encouragement of Mark Antony Lower, the 14 photographs of Lewes produced by John Case were published in 1857 as a portfolio entitled "Photographic Views of Lewes, Accompanied by Brief Descriptions". In 1858, John Case, then a tailor's foreman in his late thirties, married Margaret McGlashan (born c1832, Scotland), the daughter of John McGlashan, in Hackney, London. [The marriage of John Thomas Case and Margaret McGlashan was registered in the London district of Hackney during 3rd Quarter of 1858]. After their marriage, John and Margaret Case set up home in Western Road in the St Anne's district of Lewes. When the 1861 census was taken, John Thomas Case was recorded as forty-two year old "Tailor's Foreman" residing with his wife at 2 Western Road, Lewes. 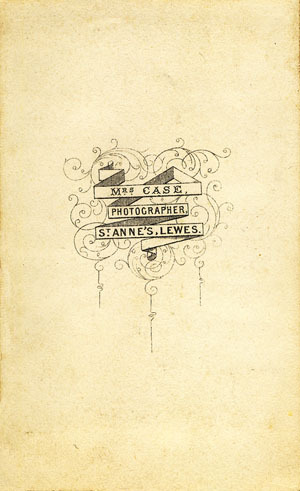 Sometime between 1861 and 1864, it appears that John and Margaret Case moved to 6 St Anne's Terrace, Lewes, where John Case set himself up as a professional photographer. John Case's venture as a professional photographer was not successful. A notice in The London Gazette, published on 28th June,1864, informed the public that John Thomas Case, Photographer of No. 6, St Anne's Terrace, St Anne's, Lewes, had been "adjudged bankrupt" under a Petition filed in the County Court of Sussex on 10th day of June 1864. Although John Case had been personally declared bankrupt, it did not prevent his wife, Mrs Margaret Case, from establishing a photographic portrait studio at their home at 6 St Anne's Terrace, Lewes. During the period 1864-1865, Mrs Margaret Case took carte-de-visite portraits in the studio in St Anne's Terrace. 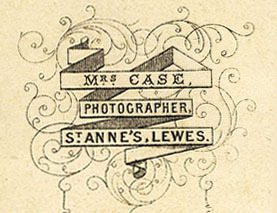 Surviving examples of her photographic work carry a trade plate printed with the words "Mrs Case, Photographer, St Anne's, Lewes". The 1865 edition of R. Simpson's Directory of Lewes lists Mrs J. T. Case as a photographer at 6 St Anne's Terrace, Lewes. 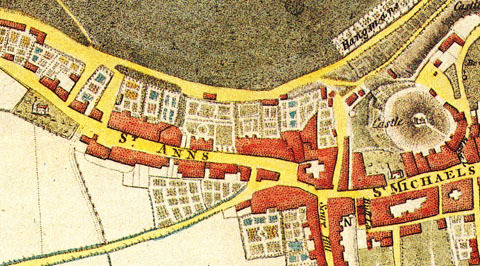 [ABOVE] Detail of an old map of Lewes showing the area of St Ann's, (St Anne's), from where both John Thomas Case and Mrs Margaret Case worked as photographers. 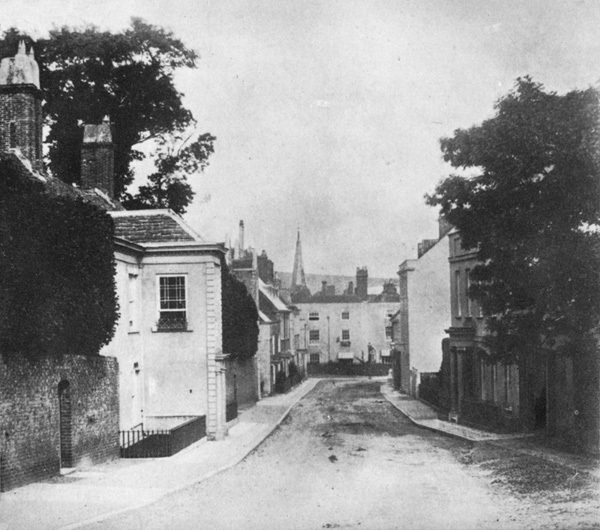 [ABOVE] The High Street, St Anne's, looking East, one of the 14 photographs which featured in John Thomas Case's portfolio entitled "Photographic Views of Lewes", which was published in November 1857. Issued by John Thomas Case from his home in Western Road, Lewes, the portfolio comprised 14 albumen prints, 12 x 18 cm, accompanied by 8 pages of text containing brief descriptions of the views of Lewes captured by Case's camera. The introduction and 'brief descriptions' were written by Mark Antony Lower of the Sussex Archaeological Society. John Thomas Case's view of the St Anne's section of Lewes High Street shows, on the left, the mid-Georgian mansion known as The Shelleys (now Shelley's Hotel). The building on this site had been owned by the Shelley family since 1663. Beyond Shelleys is Lewes Old Grammar School and, positioned in the centre of the photograph, St Anne's House at 111 High Street, Lewes, where Mark Antony Lower ran his "young gentlemen's boarding school". [ABOVE] John Thomas Case, a Photographer of No. 6 St Anne's Terrace, St Anne's Lewes, declared bankrupt in a notice published in The London Gazette on 28th June, 1864. [ABOVE] The trade plate of Mrs Margaret Case, Photographer of St Anne's, Lewes, taken from the reverse of a carte-de-visite portrait produced c1865. [ABOVE] Mark Antony Lower's introduction to J. T. Case's Photographic Views of Lewes (1857). M. A. Lower notes that John Thomas Case was "a self-taught amateur of the art of Photography". At the time he was creating his photographic views of the town, John Case was employed as a foreman in a local tailoring firm. Mr Lower praised John Case's achievement in producing a set of 14 photographic views of Lewes in his spare time. Mark Lower remarks that "with commendable industry and perseverance", Mr Case had "turned to account those few leisure hours which persons in his station of life usually devote to amusement and vacuity". In 1857, John Thomas Case published a portfolio of over a dozen photographs showing various views of the "ancient town" of Lewes. J. T. Case's portfolio was entitled "Photographic Views of Lewes, Accompanied by Brief Descriptions" and was published in November 1857. John Case had been persuaded to produce these photographic views of Lewes by Mark Antony Lower (1813- 1876), the proprietor of St Anne's House School, Lewes, and a founder member of the Sussex Archaeological Society. It was M. A. Lower who provided the brief descriptions of each scene captured by John Case's camera. John Thomas Case's "Photographic Views of Lewes" was made up of 14 views of Lewes: 1. A General View of Lewes from Cliffe Hill. 2. The Keep of Lewes Castle from the Old Mill House. 3.The Barbican of Lewes Castle. 4. School Hill. 5. Ruins of Lewes Priory. 6. The High Street at St Michael's (looking East). 7. Southover Grange. 8. The High Street at St Anne's (looking East). 9. The Old Porched House (Anne of Cleves House), Southover. 10. The Entrance to Malling Street. 11. School Hill (looking East). 12. The Keep of Lewes Castle from the Paddock. 13. The High Street at St Michael's (looking West). 14. Southover Church. In his introduction to John Case's portfolio of photographs, Mark Antony Lower suggested that if the first set of photographic views of Lewes proved successful, a second series would be produced. 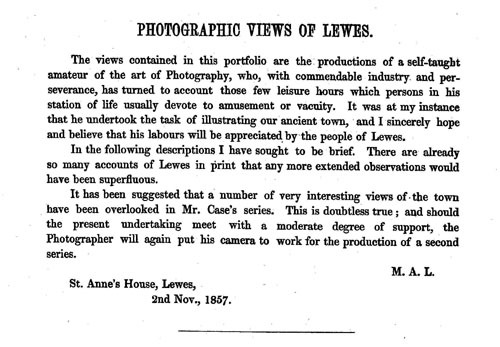 It appears that J. T. Case did not publish a follow-up set to the 1857 edition of "Photographic Views of Lewes", but a favourable response to his photographs encouraged him to take up photography professionally. 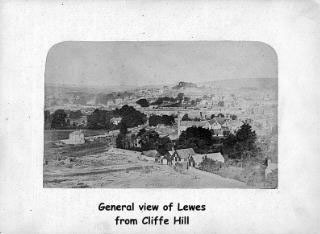 [ABOVE] A General View of Lewes from Cliffe Hill, one of the photographs which appeared in John Thomas Case's "Photographic Views of Lewes" (1857). This photograph is of special interest as it shows the course of the railway line and the location of the gas works. 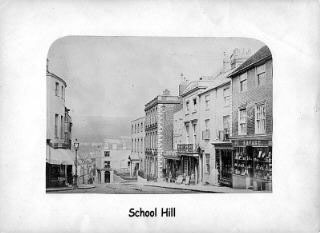 [ABOVE] School Hill, Lewes, one of the photographs which appeared in John Thomas Case's "Photographic Views of Lewes" (1857). 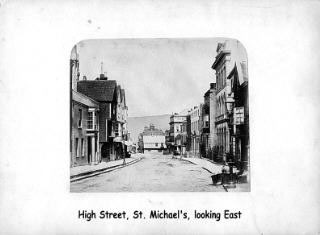 [ABOVE] High Street, St Michael's, looking East, one of the photographs which appeared in John Thomas Case's "Photographic Views of Lewes" (1857). 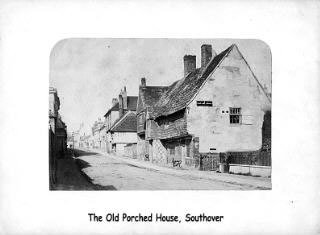 [ABOVE] The Old Porched House, Southover, one of the photographs which appeared in John Thomas Case's "Photographic Views of Lewes" (1857). [RIGHT] Mark Antony Lower (1813-1876), the proprietor of St Anne's House School, Lewes, and a founder member of the Sussex Archaeological Society. In his introduction to John T. Case's Photographic Views of Lewes, Mark Lower reveals that it was at his request that the amateur photographer made the 14 views of Lewes. Mark Antony Lower wrote the introduction to John Case's Photographic Views of Lewes and provided a commentary on each photograph in Case's portfolio. 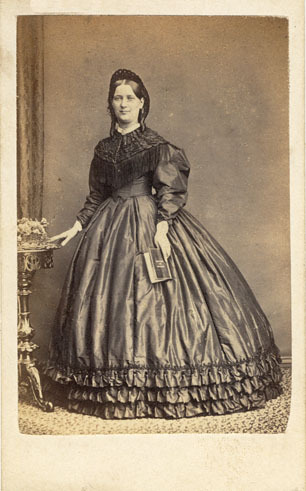 [ABOVE] A carte-de-visite portrait of a young woman wearing a crinoline dress and holding a book in her left hand. A portrait photographed by Mrs Margaret Case of 6 St Anne's Terrace, Lewes (c1864). [ABOVE] The trade plate of Mrs Margaret Case, Photographer of 6 St Anne's Terrace, Lewes, taken from the reverse of a carte-de-visite portrait produced around 1865. 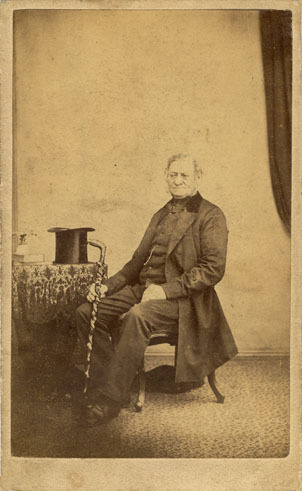 [ABOVE] A carte-de-visite portrait of an elderly man seated at a table and holding an elaborately carved walking stick in his right hand. A portrait photographed by Mrs Margaret Case of 6 St Anne's Terrace, Lewes (c1865). 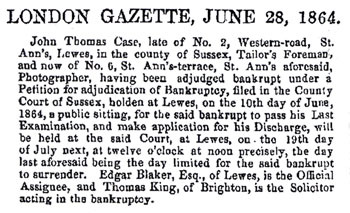 Thanks to John Kay of the Lewes History Group for drawing my attention to John Thomas Case's bankruptcy, as reported in The London Gazette in June 1864. [ABOVE] The Tester Family photographed around 1908 by James Cheetham of Lewes. [Left to Right] Harry Tester (1863-1917), a beer-house keeper and timber contractor, Lily Florence Tester (1886-1964), his daughter, and Mrs Fanny Tester (1865-1955). This photograph is featured in Kim Clark's book "Lost Lewes: Photographs by James Cheetham (1854-1921) reproduced from the original glass negatives". [See details right]. A collection of James Cheetham's original glass negatives were discovered some years ago in a cottage outhouse. The negatives were saved and copied and eventually James Cheetham's photographs were published in a book entitled "Lost Lewes: Photographs by James Cheetham (1854-1921) reproduced from the original glass negatives" with an introduction and commentary written by Kim Clark. The book, published by SB Publications in 2002, contains an account of James Cheetham's life and photographic career and collects together in one volume over 70 of Cheetham's images. I believe the book is now out of print, but it can still be obtained through second-hand bookshops and internet book dealers such as AbeBooks.co.uk. [ABOVE] Cliffe Bridge, Lewes, photographed in 1888. It is presumed that the building on the left housed the Co-operative Photographic Studio at the end of the 19th century. The Bear Hotel to the right of Cliffe Bridge dated back to the 18th century. The Bear Hotel was destroyed by fire in 1918. The Co-operative Moulding & Picture Framing Stores and Photographic Studio was first recorded on Cliffe Bridge, Lewes in the 1899 edition of Kelly's Directory of Sussex. By 1904, the business premises on Cliffe Bridge was listed as the Co-operative Picture & Photography Stores and housed The Bridge Studio. It appears that the The Bridge Studio closed around 1905. Neither the Bridge Studio or the Co-operative Photography Store was listed in the Trades Section of Kelly's Directory of Sussex when it was published in 1905. [ABOVE] Cliffe Bridge, Lewes photographed around 1906. It is presumed that the building on the left housed the Co-operative Photographic Studio at the end of the 19th century. Behind the Garage sign is the Bear Hotel which was destroyed by fire in 1918.